Very relaxing a painting. Is that a zeppeling in the background? Nice touch with the zeppelin. Is this Fringe? Foreground shadow makes it for me. 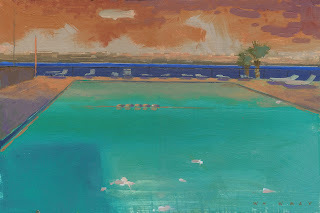 It has some connection with some Dibenkorn's paintings. Wow, nice perspective on the pool. Love the colors!